I didn’t want to leave Etat Libre d’Orange as, “Those people that made that one perfume” since they are a lovely, off-beat, and fantastic fragrance house. Jasmine et Cigarettes is one of their many very beautiful compositions. In Bottle: Tobacco is very prominent in the bottle with this fragrance with a lovely heady bouquet of dry jasmine flowers mingling with it. Applied: Tobacco, smoky and heady, with that mixture of jasmine. There’s something about this fragrance that will stick to your nose when you smell it and you won’t honestly mind it that much because it’s simply lovely. The tobacco hangs out during the majority of the fragrance, even into the spicy sweet mid-stage as a cedar note tries to come up. It’s tame cedar, and I am happy for that, as the cedar attempts to clean up the fragrance a bit but just ends up adding another layer of complexity to the smoky spicy personality of Jasmin et Cigarettes. I get a lot of jasmine in the mid-stage too, but it’s well-behaved and works fantastically with the smoke and spice. By the time the dry down approaches, I get a crisp jasmine scent with a warm amber quality along with remnants of the spicy mid-stage. Extra: Jasmin et Cigarettes was composed by Antoine Maisondieu, who is known for composing other Etat Libre d’Orange fragrances such as Antiheros. Design: Most of Etat Libre d’Orange’s bottles are the same with differing labels. You will find the fragrances bottled in a rectangular glass bottle with a very simple cap and an equally simple label listing the fragrance name and its unique graphic on it. Notes: Jasmine absolute, tobacco, hay, apricot, tonka bean, turmeric, cedar, amber, musk. I’m a little addicted to this strange little beauty. It’s got the jasmine that I love in it mingled with that smoky scent. Some days I can’t stand the smokiness, other days I can’t get enough of it. 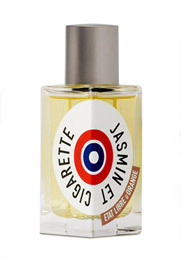 Reviewed in This Post: Jasmin et Cigarettes, 2010, Eau de Parfum. This entry was posted in etat libre d'orange, floral, Reviews By House, spicy and tagged amber, apricot, cedar, hay, jasmine absolute, musk, tobacco, tonka bean, turmeric. Bookmark the permalink.